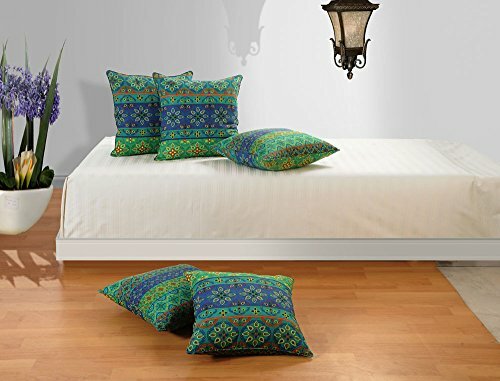 Yuga Home Décor Jade Ivy Cushion Cover 24 X 24 Inches Printed Decorative Pillowcase 2 Pcs has the following specifications Who doesn’t like a little bit of more comfort if it comes easy, so make your bouncy sofas more charming by placing fabulous range of cushion covers over them. Watch your room come to life as your children love them and play around with them. CARE: Machine wash, Don’t Soak, Cold Wash, Dry in Shade. P.S. : Photograph Shown is a set of 5 cushion covers but you can choose your required number of pieces from the given variation options on top. Explore more with our wide and beautiful collection of Cushion covers, Bed sheets and much more, click on the link “YUGA” under the title.